I couldn’t go through a week long visit to the South without checking into a few barbecue stops. Top of my list: 12 Bones in Asheville. My cousin took me and Lisa here a while ago, after they first opened, and I’d made a few visits since. 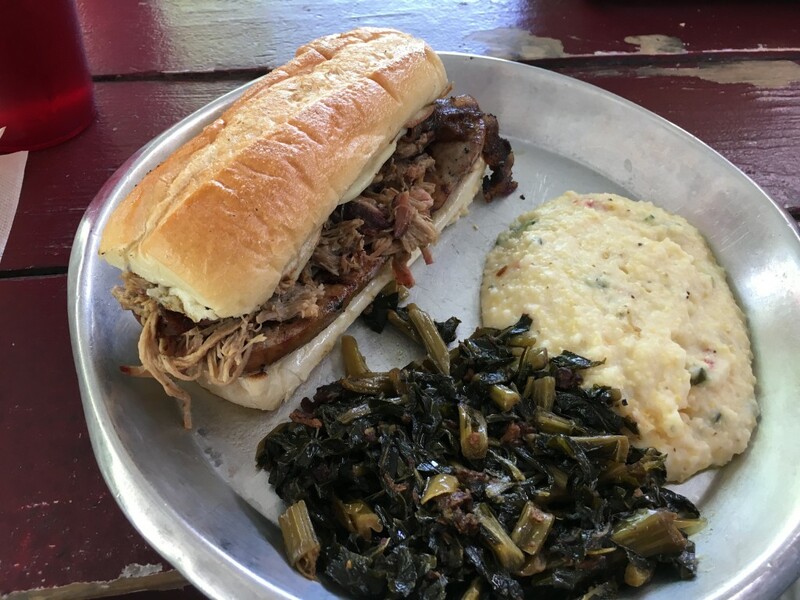 Even if they didn’t famously have a picture of President Obama on the wall from one of his several stops while campaigning, it still would have been on my short list because (a) they do pulled pork really well (b) likewise, sausages (c) they understand that side dishes are not an afterthought. They also have a sense of humor, which is why Hogzilla is on the menu. This is a hoagie roll that barely holds a bratwurst sliced in half, topped with pulled pork, pepperjack cheese, and sugar-cured bacon. I had skipped it the first few times, but was ravenous this time (we got there after 1pm). So I figured “why not” and ordered it, with collard greens and jalapeño cheese grits on the side. It arrived at the table (outside, in the cool breeze coming up from the French Broad—another reason to visit). It looked a lot bigger than I thought it would. I began to have second thoughts. Still, it smelled good, so I decided to start with the sides. First bite: the cheese grits are the real thing, with just enough heat. I try the collards next, which are delicious but not quite as remarkable as the ones at the Admiral last night (though admittedly that’s a horse of a different feather altogether). I look at Hogzilla again out of the corner of my eye: still there. Still big. I take a bite. The first bite is spectacular, with the spice flavors from the bratwurst complemented by the smokiness of the pulled pork and the sweetness of the bacon. The pepper jack is invisible, though I suspect it contributes to the sandwich’s cohesion. Before I realize it I’ve eaten two thirds of the sandwich. Then I have to slow down. I look over at my dad, who’s ordered the same thing. He’s eaten only a third of his. “That’s a lot of meat,” he says. “Yeah,” I say. I make myself finish it. I feel full. Hours later, I still feel full. I suspect I may never need to eat again. I will return to 12 Bones. But next time I think I’ll just get the pulled pork.